At some point in time, almost all animal-loving children want to be a veterinarian when they grow up. When they grow older and the reality that being a veterinarian isn’t just about loving animals (although most vets do), and more about years and years of schooling, which includes biology, chemistry, physiology and anatomy, as well as steep financial debts, they usually find a new line of work to study. For those that continue on their quest to provide care, comfort and cures for pets and their owners, selecting the best vet school they can get accepted to (and afford) is of utmost importance. To that end, U.S. News and World Report ranks the best veterinarian schools in the country each year. Consistently among the best-ranked vet schools are: Cornell University, University of California – Davis, Colorado State University, North Carolina State University, Ohio State University and University of Pennsylvania. Not only do these schools provide cutting-edge education to future generations of veterinarians, they also offer local residents a plethora of information and consultation when it comes to identifying and treating animals that carry debilitating disorders. Washington State University, another consistently top-ranked vet school, which is near Paw Print Genetics headquarters in Spokane, Wash., offers small- and large-animal veterinarian care for citizens throughout the region, with specialties in pharmacology, microbiology and pathology, neuroscience and oncology. 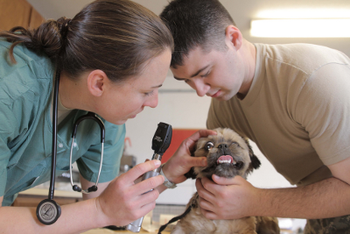 Veterinarian, CC courtesy of Army Medicine on Flickr.